Each month I join Kurt Achin, host of Koreascape on Seoul’s English-language radio station TBS eFM, for an exploration of one of Seoul’s urban spaces. This month we talk about Seoul’s chances of becoming the next great cyberpunk city (subject of my latest piece in the Los Angeles Review of Books Korea Blog), following the likes of the future Los Angeles imagined in Ridley Scott’s Blade Runner, Chiba City in William Gibson’s Neuromancer, and New Port City (or Hong Kong) in Oshii Mamoru’s Ghost in the Shell. 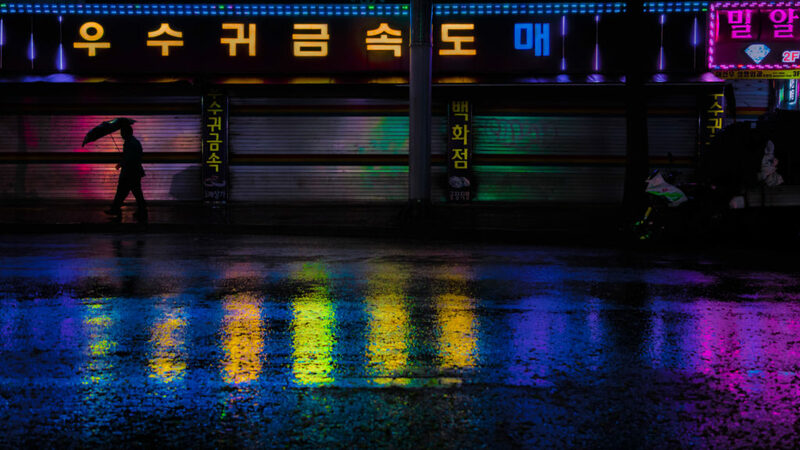 Expatriate photographers have found much of cyberpunk’s “high tech meets low life” sensibility in Seoul’s cityscape, especially on rainy nights in the parts of town full of old neon, crumbling alleys, and visible technological infrastructure. We ask what else Seoul needs to achieve proper cyberpunk status, and whether certain other cities in Africa or India might get there first. Stay tuned for further explorations of Seoul’s architecture, infrastructure, and other parts of the built environment. You can hear our previous segments here or download them on iTunes. This was written by Colin Marshall. Posted on Sunday, July 15, 2018, at 5:31 pm. Filed under Koreascape, radio, Seoul. Bookmark the permalink. Follow comments here with the RSS feed. Comments are closed, but you can leave a trackback. ‹ Korea Blog: Could Seoul Be the Next Great Cyberpunk City?